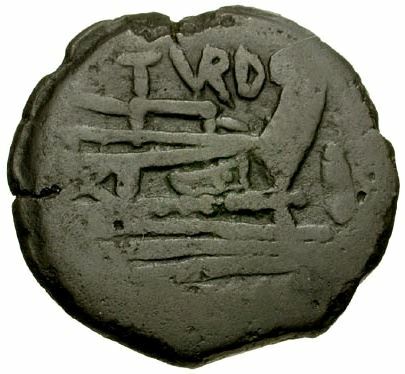 Papirius Turdus was one of the moneyers for the period 169-158 BC. He is likely the son of the Tribunis Plebis in 177 BC, C. Papirius Turdus. The original form of the nomen Papirius was Papisius, and all of the early Papirii would have been known by this name, although in later times they were always referred to as Papirii. A number of other ancient nomina experienced the same evolution; Fusius becoming Furius, Valesius becoming Valerius, and Vetusius becoming Veturius. Cicero writes that the first of the Papirii to adopt the "modern" spelling was Lucius Papirius Crassus, consul in BC 336.